Where was it supposed to be? Across central Lancashire, from west of Wigan, to west of Bolton and the M61. Ah well, it's a long one. Once again, the story starts in 1949, in the Road Plan for Lancashire. The plan contained Route 225, which was described as "Wigan - Route 6 - Bolton", Route 6 being roughly similar to today's M61. Main Route from Wigan to Bolton, also providing a route to Manchester via Route 6. From Wigan, A.577 is followed for about 3/4 mile (by-passing a level crossing en route). From its junction with Route 317 [A577 and A578 to Leigh], a new line is followed, by-passing Hindley and Westhoughton, and after its junction with B.5236, the route takes the line of an unclassified road to A.58. The latter road is then followed to its crossing with Route 6, and thence to Bolton. As can be seen, the original Route 225 went pretty much straight through the Wigan urban area rather than bypassing it, and it didn't go west of the town at all. It should be noted that it was pretty much just a link between the two towns, with no great mythical importance associated with it. Yes, it does, doesn't it. In 1966, something actually happened. Perhaps not the most exciting something, but something nevertheless. The Lancashire County Surveyor started looking at a route to connect the Skelmersdale - Up Holland Bypass (now M58, after some serious upgrade work...) to the proposed Manchester - Preston Motorway, now of course M61. By the following year, someone had clearly been doing some serious lobbying of the Ministry, as it was then announced that a west-east motorway was to be proposed to the south of Wigan. Frighteningly enough, as much of the work had already been done, the report was written in double-quick time and included the added bonus of a couple of motorway spurs to allow access to Wigan Town Centre from either direction. Then, a pause for breath. Not to worry, as when the M61 construction started in January 1968, a bridge was provided so that the Mid-Lancashire Motorway (as it had become known) could have sliproads built to connect it to M61 without causing major disruption to the motorway itself. The Upholland Bypass junction with the M6 was also designed for easy addition of the Mid-Lancashire Motorway. Alarm bells must have set off in 1969, though. The Ministry published a Green Paper entitled "Roads for the Future: A New Inter-Urban Plan". This Green Paper set out the Ministry's plans for the following 10 years or so, and looked at the whole road network of England. The Mid-Lancashire Motorway wasn't in it. I think I probably can. So the motorway was dead then? Although the Ministry had turned the plan down (pointing out that there were three main routes across southern Lancashire and northern Cheshire - M56, M62 and A580), the local authorities in the area didn't give up. 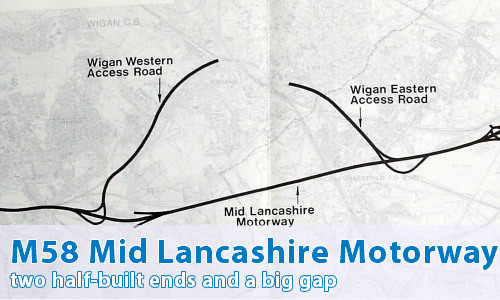 In 1972 they published a report on the Mid-Lancashire Motorway, essentially regurgitating the 1967 plan. Circumstances in local government caught up with it, when in 1974 the majority of the route came under the administrative control of the new Greater Manchester County Council. The new Metropolitan authorities were generally less keen on roads than the previous authorities, and one of GMCC's first actions in regard to the proposal was to water it down. Instead of being a motorway, it was planned to be an all-purpose two-lane dual carriageway - though GMCC did protect the route from development. GMCC was dissolved in 1986, with no progress having been made on the route. Lots of talking, but no action, eh? Indeed so. Things looked up in 1989, though! In that year, the Ministry brought the proposals back to life - sort of. The "new" proposal was entitled "M6 - M61 Link: Wigan, Hindley and Westhoughton Bypass", with three options for the eastern section - Red, Blue and Brown. Red was pretty much the old M58 route, with Brown meeting M61 further to the north, and Blue meeting the A58 roundabout at Chequerbent, where there was space for a future flyover provided - though not for the M58, but for a route to the south. The western section had only one option (Black), which followed mostly the original motorway route, but with some modifications. In 1993, the Blue Route was announced as being the preferred route, which meant that there was no chance of the road being a motorway. Ahh, isn't that sweet. You're getting all sentimental in your old age. More of an anorak, don't you mean? Could you be any more of one? OK, I'm sorry. Carry on. The road had survived the early 1990s cutbacks, but not much longer. In 1996, the axe came out and the Ministry dropped the scheme. Oh, and the eastern link to the M61 was ditched too. Can I just bang my head on the desk now, please? Of course. Just don't disturb anyone else. It's dead. Ceased to be. Nailed to the perch. In 2007, Wigan MBC finally put the whole thing out of its misery - well, apart from a tiny section of less than a mile or so. OK, can you show me the route of the M58 Mid-Lancashire Motorway? Oh yes - it's on the relevant Might Have Been Map. Can I see what was built? It's in the M58 photo gallery.